MAHABUBNAGAR, India, Mar 4 2015 (IPS) - Jawadi Vimalamma, 36, looks admiringly at her cell phone. It’s a simple device that can only be used to send or receive a call or a text message. Yet to the farmer from the village of Janampet, located 150 km away from Hyderabad, capital of the southern Indian state of Telangana, it symbolises a wealth of knowledge that changed her life. Her phone is fitted with what the farmers call a GreenSIM, which sends her daily updates on the weather, health tips or agricultural advice. “My profits have increased from 5,000 to 20,000 rupees (80-232 dollars) each season.” -- Jawadi Vimalamma, a smallholder farmer participating in a mobile technology scheme to create awareness among rural women. Three years ago, a single message on this mobile alerted Vimalamma to the benefits of crop rotation. “My profits have increased from 5,000 to 20,000 rupees (80-232 dollars) each season,” says the smallholder farmer, who now grows rice, corn, millet and peanuts on her three-acre plot, instead of relying on a single crop for her livelihood. 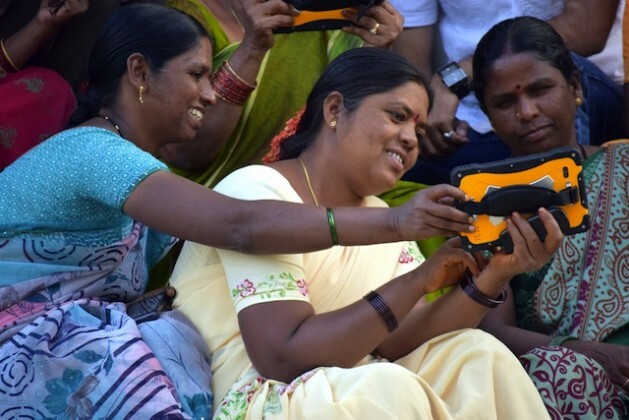 Not far away, in the neighbouring village of Kommareddy Palli, a woman farmer named Kongala Chandrakala is using the same SIM card on a device nicknamed a ‘phablet’ – a low-cost combination mobile phone and tablet computer that dispenses vital information to small farmers. The little machine has been a lifeline for this woman, who survived years of domestic violence before striking out on her own. “Fifteen years ago, I was a school dropout, living in an abusive marriage. Today, I have my own farm, and am making money,” Chandrakala tells IPS. Both women are members of Adarsh Mahila Samakhya (AMS), an all-women collective that helps empower smallholder women farmers through modern technologies. The collective has 8,000 members, 2,000 of whom use the GreenSIM card, the result of a collaboration between the International Crop Research Institute for the Semi Arid Tropics (ICRISAT) – an international research organisation headquartered in Hyderabad – together with the Indian Farmers’ Fertiliser Cooperative and Bharti Airtel – one of India’s largest mobile service providers. The scheme began in 2002, when the government asked ICRISAT to help train local farmers in drought-resilient agricultural practices. When the Institute started searching for local partners on the ground to help execute the project, AMS – then a fledgling group of just a handful of women – came forward. Shortly after, the collective used its small office to host a Village Knowledge Centre, a kind of experimental technology hub where women could learn how to operate basic devices such as mobile phones and computers, and use them to get information on climate change, groundwater levels, and adapted farming techniques that would help them increase the yields on their small plots of land. According to Dileep Kumar, senior scientist at ICRISAT, the most popular tool by far has been the GreenSIM, which disseminates a variety of bulletins daily, ranging from market prices, to weather forecasts, to tips on accessing farmers’ welfare schemes, as well as guides to crop planning and best-practices for fertiliser use. A mobile phone may seem like a humble intervention into the vast and poverty-ridden arena of Indian agriculture, but it has proved to be a literal lifesaver for many. Data from the 2011 census indicates that there are 144.3 million agricultural labourers in India, including 118.6 million cultivators, comprising over 30 percent of the country’s total workforce of roughly 448 million people. A huge portion of this workforce survives on between one and two dollars a day, pushing many people heavily into debt as they struggle to make payments on farm equipment, and costly pesticides and fertilisers. A changing climate, resulting in extreme weather events and prolonged periods of drought, does not help the situation, and scores of farmers are impacted by what experts are calling the country’s agrarian crisis. With few options open to them, hundreds of thousands of farmers choose death over life: data from the Indian National Crime Records Bureau (NCRB) indicates that 270,940 farmers have committed suicide since 1995, rounding out to a total of 45 farmer deaths every single day. Mahbubnagar, the district where the AMS is located, is well known for its recurring droughts and a wave of suicides. The district receives only 550 mm of rainfall each year, well below India’s national average of 1,000-1,250 mm per annum. The district has seen about 150 suicides since 2013 alone. Erkala Manamma, president of the AMS collective, claims that the introduction of the GreenSIM is changing this reality. Crop failure is less of a crisis here today than it was a decade ago, and thousands of farmers now feel empowered by the knowledge source that fits snugly in the palms of their hands. Gopi Balachandriya, a 50-year-old farmer from Rachala village in Mahbubnagar District, is one such example. In December 2013, he was waiting for an astrologically auspicious day to harvest peanuts on his three-acre farm until a message on his GreenSIM cell phone one morning warned him of a coming storm. “I quickly harvested my crop before the rains came. It saved me from losing my produce,” he recalls. A similar message helped Mallagala Nirmala, a farmer from the village of Moosapet, understand the need for sustainable usage of fertilisers. One day a voice message asked, ‘Have you had your farm soil tested?’ A curious Nirmala visited the Village Knowledge Centre where she learnt the basics of healthy soils, including when to add inputs of additional nutrients, which she receives free of cost from ICRISAT. The farmer is now the secretary of AMS. One of the more tangible results of this experiment in knowledge sharing has been better profit for the farmers involved. Chandrakala, one of 20 female farmers using the ‘phablet’, has increased the rice yield on her one-acre farm from 55 to 75 kg at each harvest. If she hears, via voice message, that groundwater levels are too low to support a healthy rice crop, she switches to growing grass, which she sells to a nearby community-managed dairy that produces 2,000 litres of milk a day. Having these options allows her to make between 20 and 30,000 rupees each season, a princely sum compared to the average earnings of farming families in the region, which barely touch 10,000 rupees a month. The GreenSIM initiative is certainly not the first time groups have partnered together to empower farmers using modern technology. In the northern Indian state of Haryana, for instance – where 70 percent of the population of roughly 25 million people relies on agriculture for a living – widespread use of a handheld device known as the GreenSeeker, which calculates the health of a particular crop using infrared censors, had massive success among rural communities. And in 2013, the World Bank reported on a scheme using a mobile phone app that allowed insurance agencies to collect reliable data on crop yields, thus enabling them to offer lower premiums to farmers who rely largely on rain-fed agriculture and were desperately in need of robust safety nets in the form of insurance policies. In the first year alone, some 400,000 farmers in 50 districts across the northern and western states of Maharashtra and Rajasthan benefitted from the scheme. The challenge for policy makers is how to replicate such initiatives on a wider scale, in order to ease the abject poverty facing millions of farmers across India – particularly the women, who are most vulnerable to the crushing impacts of poverty and hunger. Very interesting. Problem in India seems to be making this information available all over the country. Else promising, innovative efforts remain isolated. Medical journals publish results of trials conducted all over the world and practitioners are able to use the information to save lives. Is there a similar publication for agriculture that would publish success stories across India? Of course it would need to be translated into the various languages to be accessible to all. But a start in English would be great.